From the 1980s Jacky Redgate has explored the interplay of systems of perception and representa-tion, particularly in relation to photography and what occurs in the translation of three-dimensional ‘things in the world’ into two-dimensional images. In turn, Redgate has made sculptures and objects which are either impossible to photograph or which are optical or perceptual conundrums. Typologies, the classificatory systems through which multiple examples of something are compared to discover the most prevalent qualities of that thing (the ‘type’), are another subject of interest to Redgate: photography’s ability to visually document and circulate information has been frequently used in typological research. As the historian and critic Ross Gibson has said, ‘artwork such as Redgate’s is perhaps best understood primarily as active research’, however it is also visually engaging and imaginative, enabling reverie rather than illustrating science.1 Redgate’s use of found and family photographs in some works adds a more personal and subjective dimension. As with many other artists working at this time, Redgate was also interested in the history of art, particularly northern European art. 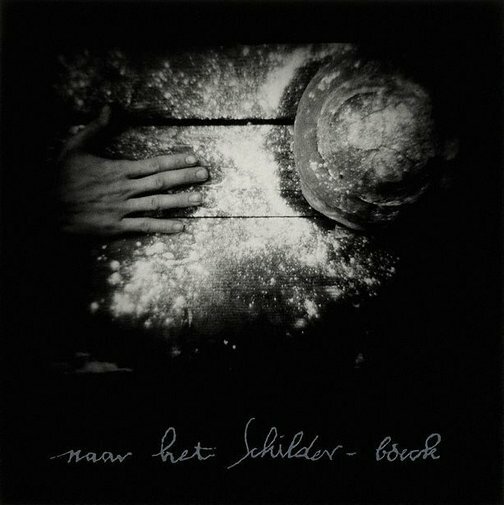 The title of the series of six photographs ‘naar het Schilder-boeck’, meaning ‘from the book of painting’, is sandblasted onto the glass in the frames in a stuttering script which looks handwritten and centuries old. The title refers to the medieval and Renaissance source books of symbols and subjects for art, systems through which painters could find a suitable iconography. The source for Redgate’s series is actually an oil painting by Pieter Bruegel from 1559 known as ‘Netherlandish proverbs’ or sometimes as ‘The blue cloak’. This painting is an extraordinary visual compilation of close to 100 proverbs illustrated through scenes of human and animal folly, the exact number unquantified due to the overlapping meanings of its different scenes. While Bruegel’s painting has provided inspiration for Redgate’s photographs, she has not directly restaged or replicated episodes from it. In Redgate’s work the popular proverb ‘big fish eat little fish’ is illustrated with a large fish which has been sliced open, with smaller fish spilling from its belly and either into or out of its mouth. It is more surreal than evidentiary, as the undigested little fish spew out of the equally dead large fish, and there are no winners in this scenario. In ‘He cannot reach from one loaf to the other’, a hand reaches across flour-strewn planks, presumably a rustic table top, for a loaf of bread. This now more obscure proverb refers to a person who cannot make ends meet or manage his or her life. Redgate’s images in this series are all close-ups and the human, when present, is reduced to a disembodied hand reaching into the frame. There is no spatial depth; the dark void from which the objects and forms emerge adds to the enigma of these photographs. Wayne Tunnicliffe, Contemporary: Art Gallery of New South Wales Contemporary Collection , 'Cultural memory, critical distance', pg.154-203, Sydney, 2006, 157, 188 (illus.). Australian Perspecta '85 , Sydney, 1985.
Review: works by women from the permanent collection of the Art Gallery of New South Wales , "Women Artists in the Contemporary Collection", Victoria Lynn, p13-15, Sydney, 1995, 15, 25.